After being a coach at CrossFit South Brooklyn in NYC for 6 years I moved halfway across the country to open my own affiliate, CrossFit Lumos, in Austin, TX. 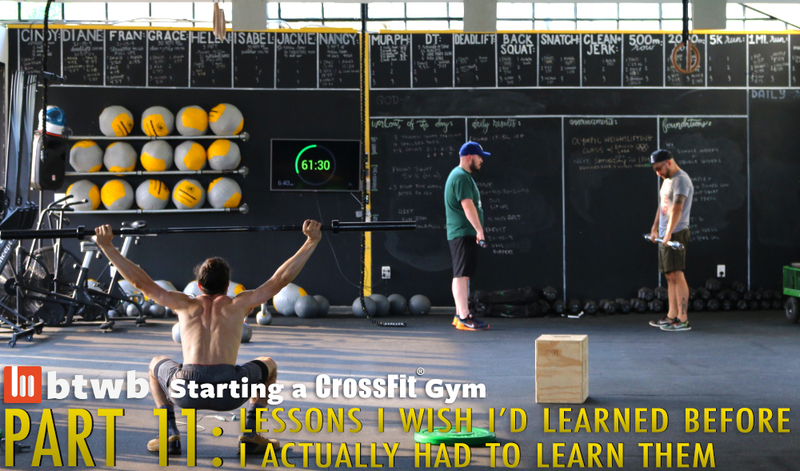 This series will chronicle my experience opening the gym and what I am learning along the way. This article is the final piece of the adventure, before I’m a real live gym owner. Part 1. Part 2. Part 3. Part 4. Part 5. Part 6. Part 7. Part 8. Part 9. Part 10. Get Help: Many people open gyms with a partner, their spouse, or a team already in place, and for good reason! There are lots of moving parts to a gym, and each added hand is valuable, not to mention the perspective each person brings. When I started the gym my plan was to initially do everything myself, which seems absolutely insane to me now. I had been working long days and coaching lots of classes at the gym I worked at, so I figured it would be similar- it’s not. I luckily found my first coach almost by accident, and without her I can’t imagine a scenario where I would not have gone nuts by now. Having people to talk to, to bounce ideas off of, to collaborate with, all of these things are invaluable. Don’t try and do everything yourself- from a mental, emotional, and even organizational aspect, it won’t work. It Follows You Home: When you are a coach your work rarely follows you home at night- you give your all to your classes, and aside from some continuing education work, programming for clients, etc. you can pretty much turn it off when you leave the gym. For an owner (at least in the beginning) your day is never really done, something can always absorb your time and attention. Be ready for it, and be ready to work at strange times or have to rush to the gym or to your computer to fix some problem that appears from out of nowhere. It’s Not Your Old Gym: If you previously coached at another gym it’s tempting to try and copy much or all of that successful formula, but it likely won’t work. Even if you are staying in the same general area (not moving halfway across the country like this intrepid fool) the CrossFit “landscape” has been changing so rapidly that the challenges you will face will likely be different than those at your old gym. In the beginning I bemoaned having to do many of the things that my previous gym hadn’t had to bother with, but I quickly realized that my business was something that exists in a specific and unique time and place, and that it was my responsibility to adapt. Buy Less Equipment: This may be unique to me, since this brotha loves him some online shopping, but you can probably get away with less equipment than you think you need. I bought some things (or quantities) that I could have probably waited on in the beginning. Let your needs dictate what you buy, and the only way to figure that out is to start running classes. You Need a Lot More Stuff Than You Think: This may seem to run counter to the last point, but I’m not talking big ticket items here. I mean little things like rags, markers, tape, etc. I did a pretty detailed equipment budget, but make sure you leave a good amount of space for all the small ephemera that you usually ignore in a gym- they add up. Don’t Get It Twisted: In the end, while things like equipment purchases, marketing budgets, and crashed websites can trip you up, the core of a CrossFit gym is people. If you are treating your people right, things will go right, even if they don’t happen in the manner or on the timeline you initially imagined. Pour all of your heart and soul into your members and their experience, get to know them, play with their kids and their dogs. Some days I coach from 6a to 9p, with lots of “boss work” in between, and an interaction I have with a member in my last class will make it all seem like a walk in the park. Remember why you got into this business- for most of us it wasn’t for an easy buck, but to share, teach, and practice something we love and that gives our lives greater value. Your business will endure lots of blips and bumps but that desire will endure, and in so doing make the space and community you are shepherding similarly strong and enduring. Affiliate marketing is not a get rich quick opportunity. It takes time to build your audience and establish your credibility. I learn more every day. Don’t let that scare you. When you make a sale, it is an awesome feeling. It takes consistent daily action and commitment. When I get discouraged, I watch YouTube videos that inspire me to continue. Setup a daily action list and stick to it. You don’t need anything fancy, just something to keep you focused and active.